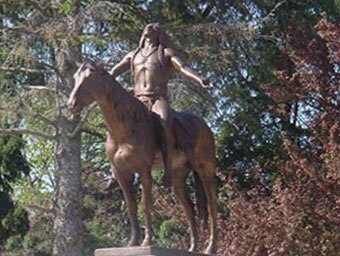 Appeal To The Great Spirit / Chief Munseee—a bronze statue by the sculptor Cyrus Dallin, was yet another gift to the City of Muncie from Mrs. Edmund B. Ball, wife of one of the Ball brothers, of Ball Glass Manufacturing Company. Read the letter from her son regarding his mother's determination to have the statue for Muncie; click here. Our galleries here feature pictures from some of our events, some pictures of members at games, some commemorating a special time in our club's history. If you have any pictures that you would like to share with our members, we will be happy to display them in their own gallery. To submit pictures, please contact info@munciebridgeclub.com.